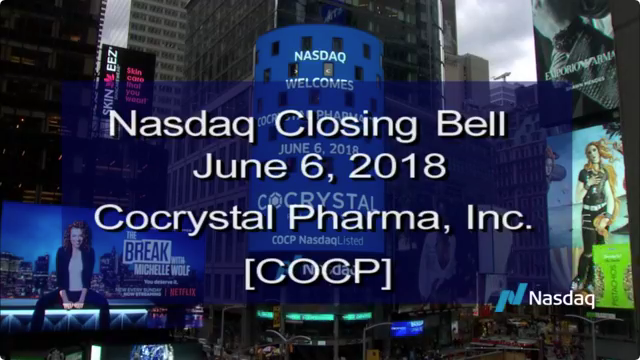 BOTHELL, WA, Jan. 07, 2019 (GLOBE NEWSWIRE) -- Cocrystal Pharma, Inc., a biotechnology company with a proprietary technology platform focused on developing medicines to treat viral diseases, today announced changes to its board of directors. Dr. Raymond F Schinazi, who has served as chairman or co-chairman of Cocrystal’s board of directors since November 2014, has elected to retire from the board on February 1, 2019. Pending compliance approval from his academic affiliations, he will become a special advisor to the CEO and also serve on the scientific advisory board. The board of directors has appointed Dr. Gary Wilcox to serve as chairman, in addition to his position as CEO, effective on February 1, 2019. “On behalf of Cocrystal’s management and Board, I would like to thank Ray for his many contributions over the last four years,” said Dr. Wilcox. “I am delighted that Cocrystal will be able to continue to benefit from his expertise as an advisor.” The company also announced that Dr. David Block has also elected to retire from the board on January 4. The Company is in the process of reviewing several identified board candidates. The board looks forward to working with its new members to help propel Cocrystal forward in its mission.